The new alloy exhibits a superior strength of 1.5 gigapascals and a ductility as high as 50% in tension at ambient temperatures. Photo: City University of Hong Kong. 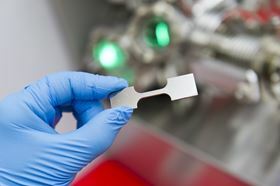 A research team led by scientists at the City University of Hong Kong (CityU) has developed a novel strategy for developing new high-strength alloys that are extremely strong and yet also ductile and flexible. This strategy overcomes the perennial dilemma caused by the trade-off between strength and ductility, paving the way for developing innovative structural materials in the future. Multiple-principal element alloys, generally referred to as high-entropy alloys (HEAs), are a new type of material that comprise equal or nearly equal quantities of five or more metallic elements. HEAs are currently the focus of attention in materials science and engineering due to their potentially desirable properties for structural applications. Yet most of the alloys share the same key weakness: the higher the strength of an alloy, the lower its ductility and toughness, meaning that strong alloys tend to be less deformable or stretchable without fracture. Led by Liu Chain Tsuan, a professor in the Department of Materials Science and Engineering at CityU, the research team has now found a breakthrough solution to this daunting decades-long dilemma. They have made high-entropy alloys that are strong and yet also very ductile through massive precipitation of nanoscale particles. They report this work in a paper in Science. "We are able to make a new high-entropy alloy called Al7Ti7 ((FeCoNi)86-Al7Ti7) with a superior strength of 1.5 gigapascals and ductility as high as 50% in tension at ambient temperature. Strengthened by nanoparticles, this new alloy is five times stronger than that of the iron-cobalt-nickel (FeCoNi)-based alloy," says Liu. "Most conventional alloys contain one or two major elements, such as nickel and iron to manufacture," he explains. "However, by adding additional elements of aluminium and titanium to form massive precipitates in the FeCoNi-based alloy, we have found both the strength and ductility have significantly increased, solving the critical issue of the trade-off dilemma for structural materials." Moreover, high-strength alloys usually face plastic deformation instability, known as the necking problem. When an alloy is under a high strain, its deformation can become unstable and very easily lead to a necking fracture (localized deformation) with very limited uniform elongation. But the team has found that adding ‘multicomponent intermetallic nanoparticles’ – complex nanoparticles made of different element atoms – can greatly strengthen the alloy uniformly by improving the deformation instability. They have also found the ideal formula for these complex nanoparticles, which consist of nickel, cobalt, iron, titanium and aluminium atoms. Liu explains that each nanoparticle measures just 30–50nm. The iron and cobalt atoms that replace some of the nickel components help to reduce the valence electron density and improve the new alloy's ductility. On the other hand, replacing some of the aluminium with titanium helps to reduce the impact of moisture in the air, limiting embrittlement in the alloy. "This research opens up a new design strategy to develop superalloys, by engineering multicomponent nanoparticles to strengthen complex alloys to achieve superb mechanical properties at room and elevated temperatures," says Liu. He believes that the new alloys developed with this novel strategy should perform well in temperatures ranging from -200°C to 1000°C. This means they could potentially find use in cryogenic devices, aircraft and aeronautic systems, and beyond. This story is adapted from material from City University of Hong Kong, with editorial changes made by Materials Today. The views expressed in this article do not necessarily represent those of Elsevier. Link to original source.